Canty delivered the free-flowing plainsong with pure and expressive unanimity, Taylor's murmuring harp background colouring the extended evening with a delicate, ethereal haze. Der Abend begann mit dem schottischen Interpreten William Taylor, der eine früher auf den Knien zu spielende Form der Harfe aus dem 8. und 9. Jahrhundert (als Nachbau) spielte. Er interpretierte frühe schottische Werke, die in eine Zeit entführten, die man nur aus Geschichtsbüchern oder Legendenbeschreibungen kennt. Berauschend der Klang dieses mit Messingsaiten bespannten Instruments. Taylor verstand es meisterhaft, seinem Instrument den lyrischen Klang der auf die Harfe übertragenen volksliednahen schottischen Lieder zu entlocken. King of the Strings! ... Undoubted highlight of the golden hour and a half for me was a selection by the great blind harpist, Rory Dall Morison. The 17th century master could only have applauded Bill Taylor’s sensitive rendering. The variety of sounds and textures produced through Bill’s artistry was always captivating. His complete mastery of the instrument and inspired interpretation brought life to music which was sometimes unfamiliar. 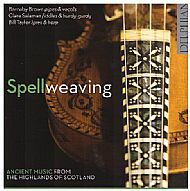 Reviews of "Spellweaving: Ancient Music from the Highlands of Scotland"
… The performances are excellent, the sound very good and the program something extraordinarily revelatory. Anyone who cherishes early music will encounter a rare and exciting look at the heretofore mostly lost oral tradition in the Highlands region. It brings us something of what we are missing from the strictly notated musical heritage, a "folk" tradition frozen in time, an unearthing of an archaeological find, musically speaking, that speaks volumes. I hope they give us another round of this music, at least, since they but scratch the surface of the full holdings of Chris Campbell's Instrumental Book 1797. This is an outstanding CD, as entertaining as it is revelatory. I highly recommend it to you. Opening with the sound of a rowing boat, seagulls and breaking waves is just the start of an extraordinary aural journey exploring the ancient music and instruments of the Scottish highlands. … Most of the pieces have an extraordinarily hypnotic, almost trance like feeling, aided by constant repetitions of tiny little motifs underlying a narrow-range melody over a long time-span. Track 4 is an example, the Sutherland Gathering, played on Hardanger fiddle and lasting around 15 minutes; as is track 6, the minimalist Horse’s Bridle Tune. There are two samples of canntaireachd, the Gaelic vocalising of bagpipe music used as a learning tool by pipers. The interpretations are imaginative and beautifully played. Placing [the music] in the context of other research, and keen to reference a broader musical world, Brown and his fellow musicians Bill Taylor and Clare Salaman have asked the question: does this manuscript provide a window on to a musical culture beyond the piob mhór or great pipe of Highland culture? The resulting arrangements of pibroch for Taylor’s lyre and clarsach, Salaman’s fiddles and hurdy-gurdy and Brown’s Highland bagpipe and vulture bone flute provide a fascinating view of how music might have been evolving in Scotland before 1800. I never expected to find myself interested in listening to pibroch, but this release has changed that! The related website is also well worth exploring. Reviews of "Two Worlds of the Welsh Harp"
Full [of] narcotic magic ... [the] dexterous elaborations are simply stunning in their virtuosity, while many of the daring harmonic progressions make the jaw drop ... Anyone expecting a gentle stroll in the Celtic twilight is in for a rude awakening -- and about time too! Never has there been anything like this before ... beautiful it is. Strange and lovely the little bird-like burblings of those teasing strings ... a haunting world of the remembered sounds that only the innocent ear can recapture, and [Taylor] has captured them with a sophisticated ear that has not lost its innocence. Taylor has done more than rectify the neglect from which the Welsh harp has unjustly suffered -- he has given us 70 minutes of unique, if not slightly quirky, music... Honest, authentic, disciplined and true to its purpose, this CD is a refreshing contrast to the seeming endless oeuvre of pretentious New Age junk that passes for but ultimately insults the great tradition of Celtic harp music. Improvisatory preludes with the personal expressiveness of Chopin and the rhythmic inexorability of John Fahey. Truly oustanding ... informed by scholarship, imagination, rock-solid technique and fine musicianship... both thrilling and shocking ... this is a fascinating, revelatory CD. Here’s a harp CD to shatter your tooth enamel! ... Throughout, Bill Taylor gives a masterly performance, turning academic interest into brilliant artistry. At all times, his interpretations are well-executed, and his playing speaks with clarity and excitement. The recording quality is nothing less than excellent, with stunning ambience. This is obviously a very interesting program, the longest yet devoted to Binchois' songs. The interpretation combines both novel and conventional elements, making for a production that pushes the envelope a bit but yet remains very recognizable as songs we know & love. I must add that I really enjoy the occasionally featured sonority of the harp on this recording. Distinctive resonance of Scots spirituality and the immaculate tuning and balance of the four female singers of Canty. 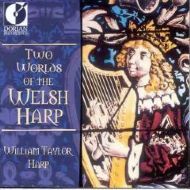 William Taylor weaves harp interludes with atmospheric skill, even enhancing the plainchant. Ethereally beautiful. Canty and designed to showcase the group’s sonic purity. The performances, which were recorded in Edinburgh's Greyfriars Church, are exceptional, with Canty's characteristics striving for absolute clarity of diction without sacrificing a sense of line or harmonious, crystalline stillness. 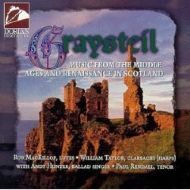 Taylor's harp accompaniments, whether improvised or from a score, and whether on the gut strings of the Romanesque or late-Mediaeval bray harp, or the brass and silver strings of the Mediaeval clarsach, are colourful, evocative and utterly expressive of the prevailing text. The voices are pure, beautifully tuned and finely balanced even at the tightest, most radiant dissonances... Taylor's various harps have an honest, rustic appeal - or sitar-like in the Tavener against angelic ad libbing voices, eternal drones and wondrous, other-worldly harmonies. Top-quality singing with the programme blurring the expected distinction between ancient and modern. It sounds gorgeously detailed and almost luminous on an HDCD-compliant machine, with fine vocal definition adding to the depth of the experience. However, if you have equipment able to handle it, download the 192kHz/24-bit Studio Master version, which takes the sound quality onto a whole new level, and is simply jaw-dropping in its sense of space and presence. 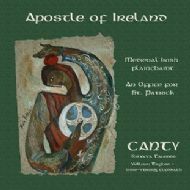 Reviews of "Apostle of Ireland"
A recording shot through with a sublime, still beauty... What ornamentation there is to be found, is left to the subtle, sugar-sweet and wholly appropriate harp accompaniments improvised by William Taylor that glisten and sparkle against the uniform plainchant backdrop like starlight at the dying of dusk. In a word: blissful. A special role is given to William Taylor, playing a wire-strung clàrsach. This Celtic harp is used in several chants, for instance the opening hymn, but also in most of the responsories. "The harp accompaniments, improvised by William Taylor, pay tribute to a growing body of iconographical evidence supporting the view that harps were played in Celtic religious foundations", Rebecca Tavener writes. She also refers to the fact that a harp is listed in the inventory of a Scottish monastery as late as the mid-16th century. This is no evidence that the harp was indeed used in liturgical music as performed on this disc, but it certainly adds some plausibility. William Taylor's improvisations are stylish and never obtrusive, and are a delightful addition to the performances by the four singers of Canty. Reviews of "Flame of Ireland"
Rebecca Tavener's beautifully characterised chanting brings the narrative grippingly to life, and the ethereal accompaniments improvised on the clarsach (wire-strung harp) give the performances a spellbinding feel of timelessness. The unison singing, or more properly chanting, is exceptional, with a lightness and grace that effortlessly illuminate the texts of the antiphons and responsories. By contrast, Rebecca Tavener’s recitations of the lections are full of delicate colour and drama. She is very conscious of the story-telling aspect; consequently the legends and miracles surrounding St Brigit’s conception, birth, infancy and adulthood are brought vividly to life... Throughout, Taylor provides evocative improvised accompaniments and interludes, both of which serve to centre the prevailing mode and amplify the meaning of the texts. On this disc, what is especially attractive is the occasional appearance of the very Celtic clarsach harp, an instrument increasing in its popularity. William Taylor improvises in the appropriate mode, something which he has been studying for some time. Stories of all sorts were often chanted, as here, on just three or four notes. The effect is like the chanting of an epistle or gospel, or a declamation to the accompaniment of the clarsach in a hall or meeting room. The instrument makes its first entry with the story about King Dubthach and his affair with his servant girl, Brocsech, with whom he has a famed daughter, St. Briget herself. The story of the saint is told throughout the disc with, in between, nine nicely chosen responsorial plainchants and Antiphons (short prayers) suitable for Matins on her Feast day. These fit aptly with the reading or I should say the Lectio. The clarsach also plays for most of the Antiphons, which are in a different mode from the Lectios. In this way what we might call ‘key fatigue’ is avoided and contrast offered. ... These plainchants are divided nicely between solo lines and tutti voices with the wire-stringed clarsach weaving delightfully in and out of the texture. Each singer is superb. The tuning is immaculate - as one has come to expect in early music. The text is delivered in the Lectios in a dramatic manner where necessary and with beautifully clear diction. It is a good idea to follow the texts and their excellent translations by James Reid-Baxter - some of it in quite obscure Latin - as one can more appreciate what William Taylor is attempting on the harp by way of descriptive word-painting. For example when Brigit as an infant is left in a house which suddenly catches fire, the harp likewise seems to catch a flame or two from the blaze. Canty here give us a selection from the work contained in fascicle 11 of [the St Andrews Music Book], and the results are very beautiful. All the polyphonic writing is in two parts and Canty give a persuasive account of it. There’s a radiance of sound that beguiles the ear and gives a particular quality to these settings of texts in praise of the virgin which are often quite sensuous in their language and imagery... There is much to admire and enjoy here... There is occasional instrumental accompaniment from William Taylor, always discreet... It was, I think, The New Yorker which once described Anonymous 4 as the “fab four of medieval music”. 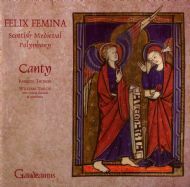 Canty bid fair to be Scotland’s “fab four of medieval music” on this well-conceived and executed CD. Reviews of "The Miracles of St Kentigern"
An inventive and thoroughly convincing recording of fascinating music. Reviews of "Notes of Noy; Notes of Joy"
Ravishing, resonant sounds, radiant singing ... stunning ... a real spirit lifter ... A must for all folks as well as classical fans, and anyone remotely interested in Scottish culture. This is a uniquely Scottish sound ... of fundamental importance in how we interpret renaissance music ... here is a contribution Scotland has to make, which is an absolutely lovely sound ... just so beautifully self-explanatory ... played with great feeling.